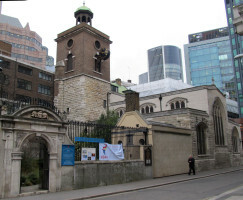 Within and adjacent to the old borders of the City of London - the Square Mile – there are around 50 churches, in various states of accessibility and of a range of ages from bits of Norman and medieval through to the multitudinous Wren churches, some alterations and new ones in the 18th century, a crop of 19th century Victorian churches, and the modern rebuilds and replacements particularly after the devastation wrought in the area by the Second World War. 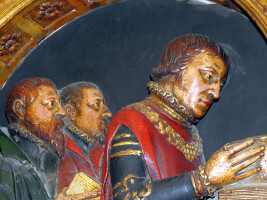 Further down this page are links to the various City Churches whose monuments and sculpture are described on this site. 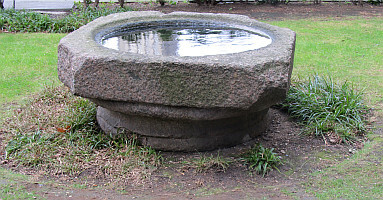 This site, with its emphasis on sculpture, does not have much to say on the complex history of the City Churches, but we should note at least that most of the existing buildings are on the sites of previous churches, sometimes a series of them, and we know that even some of those were built on the sites of temples from the ancient world. 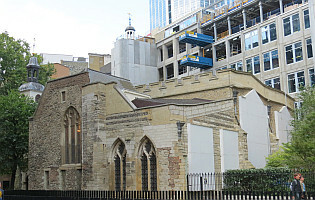 Very little survives in City Churches from Norman times – above all in the Temple Church off Fleet Street and St Bartholomew the Great – and much of the medieval work was swept away first in the dissolution of the Monasteries in the time of Henry VIII, when although some priory churches became parish churches, many were lost. The Great Fire of 1666 of course destroyed most of the churches in its path. 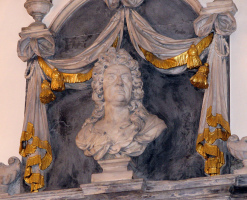 In some cases Christopher Wren’s 50-odd rebuilds started from scratch, in others he was able to use the foundations and maintain the shape of the older churches, or keep a tower or walls. 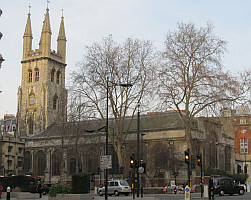 The 18th Century saw some further collapses and rebuilds, and the town planning of the Victorian era witnessed further rebuilding as a few churches were moved or pulled down for road widening or to make room for municipal buildings fit for the capital of an expanding and increasingly wealthy capital city. 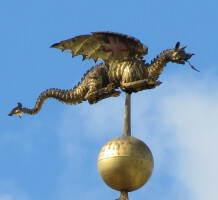 There was also much by way of restoration, sometimes sensitive, elsewhere not – as ever, the Victorians were (rightly) supremely confident in the excellence of their craftsmanship and design, and although they produced much which was beautiful and splendid, also changed much which a later generation might have chosen to preserve. 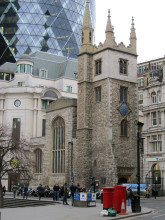 All the way through the later centuries, too, we must be mindful of the changing population, first growing but then moving outwards, as the City became more of a place of great commercial enterprises, but less of a place to live and hence with less need for churches. With the commerce also came the great pressure on use of land, so that a church considered superfluous when there were so many nearby was always going to be at risk. 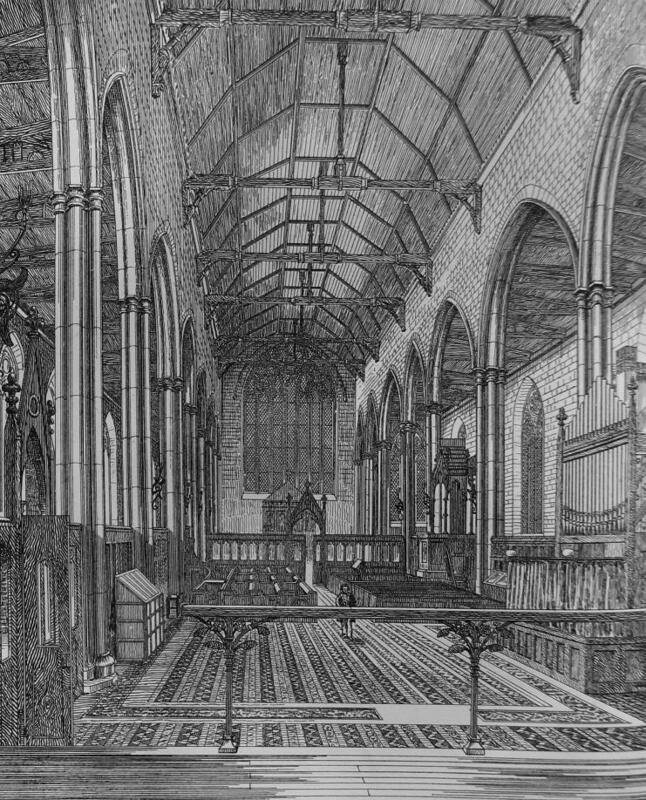 In the 20th Century, the bombing of World War II led to many churches being utterly destroyed, ruined, or with their roofs gone and their interiors burnt out – some were imaginatively restored, mostly in the 1950s, others were not. 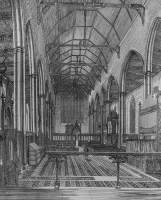 In all of this history, different parts of churches fared differently. A tower might not last as long as the nave and body of a church, collapsing after some hundreds of years and need replacing. Conversely, in a fire, even the Great Fire, towers might survive, and perhaps outer walls, when all else in the interior was lost. Lower walls and porches stood a better chance than upper walls and roofs, and crypts could survive when everything above ground was levelled. And even in the Second World War bombing, some towers survived and were preserved when the rest of the church disappeared. 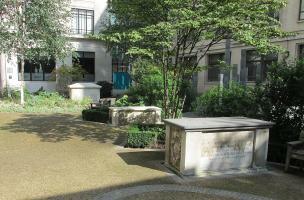 And our sculptured monuments? 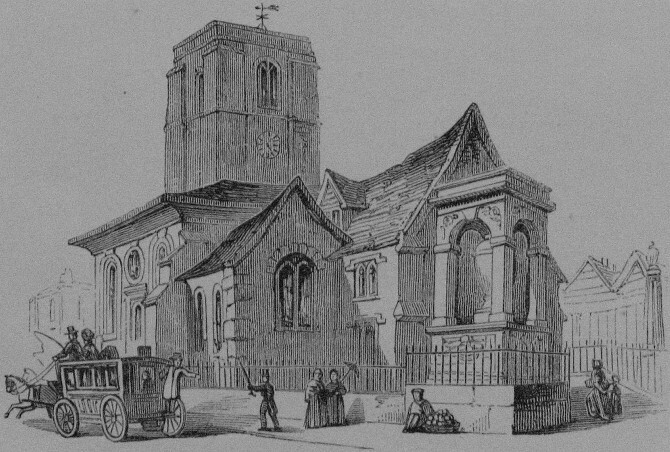 Many, many were lost in the Fire, as we know from John Stow (or Stowe), the great historian, who recorded large numbers of church memorials in his Survey of London published in 1598 and in enlarged form in 1603. 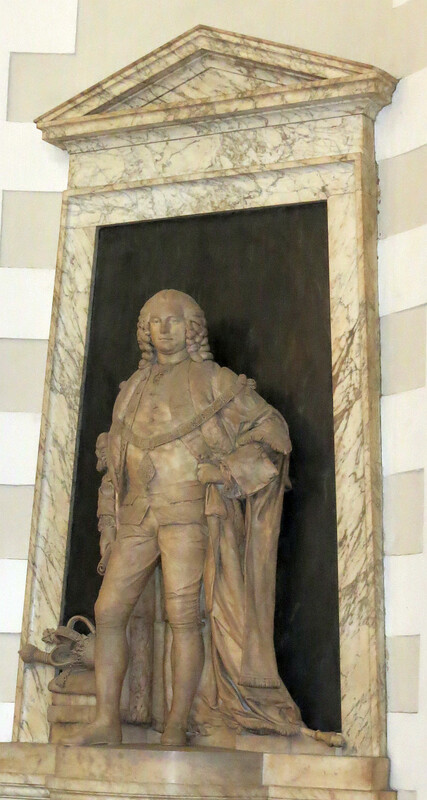 We can still see his own Elizabethan monument in St Andrew's Undershaft. 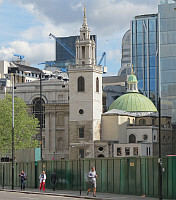 But some few survived, and were taken from old churches being demolished to be put in Wren’s or later replacements. Similarly, many 17th and 18th Century memorials have lasted better than the original fabric of the buildings, and even bombings spared many tablets and other monuments. 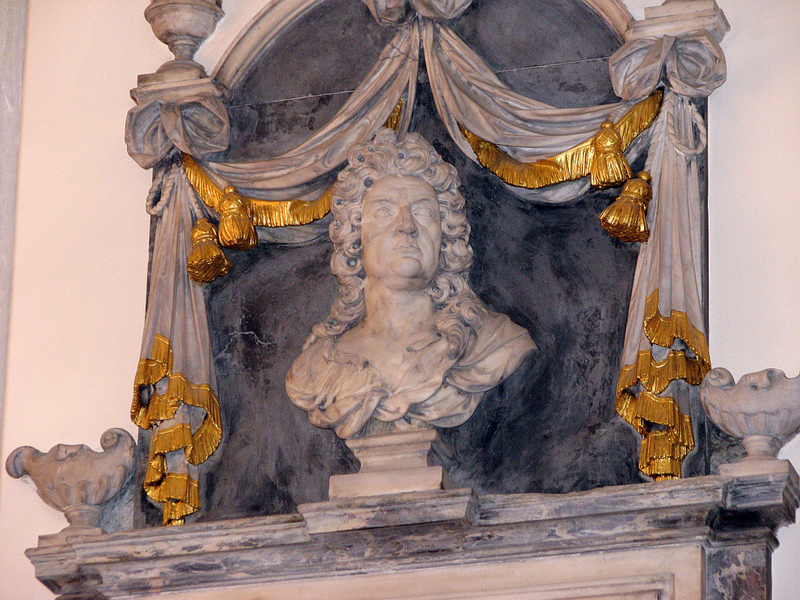 The monuments in the City Churches are different in kind from those we typically see elsewhere in the British Isles. Though disasters befall many places, the Great Fire and the carpet bombing of World War II have no parallel in many parts of the country. So with exceptions, we will not find in the City Churches the unbroken line of monuments from Norman through Medieval, Renaissance through to Victorian times that we may find in many of the great Cathedrals and some of the nobler parish churches. 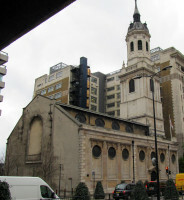 Nor, in their confined spaces – as nearly all the City Churches are small, sometimes very small – will we generally find the largest and most complex 18th and 19th Century monuments with full size figure groups – for those, in London, would generally be in Westminster Abbey and St Paul’s Cathedral (not covered on these pages), and the Guildhall. Again, in this way the City Churches differ from what we may see elsewhere in England. On the other hand, the City did have an unparalleled concentration of the great and the worthy, and there are many costly and beautiful smaller monuments, such as we would be unlikely to find in churches of equivalent size elsewhere. 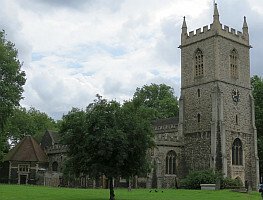 Styles, like the churches themselves, are mixed, with mostly Classical for the 17th and 18th century, yielding to Gothic in the 19th Century, recalling the much earlier Tudor and medieval work, such as remains. And every now and again, through to Victorian times, a hearkening back to the complex idioms and character of medieval times. It should also be noted that some of the largest cities - Birmingham, Manchester and Liverpool for example - were really rather small before 19th Century industrialisation, so that the many 17th Century or even 18th Century churches and monuments of London have little parallel in those places, where there may be just a few parish churches swallowed up in a sea of Victorian edifices. An introduction to smaller church monuments is on this page. 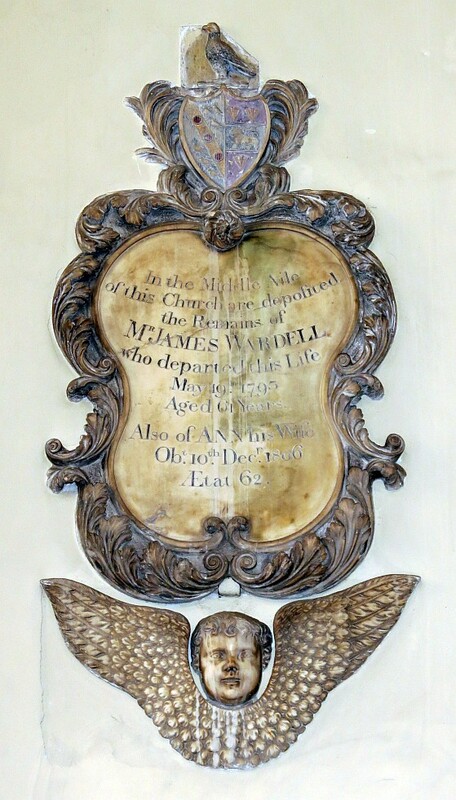 Church furnishings – wooden things like carved pulpits, altar pieces, organ cases and pews, metalwork such as sword rests, brasses, candelabra and chandeliers, are not the concern of these pages, but we may note that much survives from the time of Wren, in particular delicately carved wooden furnishings generally attributed to Grinling Gibbons. Such, along with fonts, are noted only in passing on these pages. There is notice of the architecture, but superficially, and from secondary sources, and I would emphasise my knowledge is based on casual interest rather than any pretence at understanding, and likewise the history is sketchy and relies on popular books rather than anything academic. I have not generally commented on sources for this website, as the sculptural sources are numerous. But it may be helpful here to note that for the history and architecture of London churches, I have relied on Stow at the very beginning of the 17th Century, the excellent volumes by Godwin and the various popular magazines from the earlier part of the 19th Century, the main art and architecture periodicals from the late 19th century, and works of compilation such as the excellent Old and New London volumes, which borrow freely from earlier sources in text and pictures. The engravings are from the 19th Century sources, and the modern photographs are generally my own. I would not wish to use modern interior photos, even my own, without seeking permissions from the guardians of the buildings, so where I have not sought and received this, interior pictures on these pages are generally engravings and earlier photos, which means that many of the monuments in the churches are generally described in text rather than illustrated: I hope they will be found of interest nevertheless. 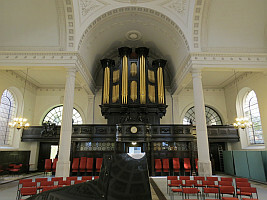 St Stephen Walbrook (near Bank and Cannon Street).